Isabella, Angelina and Francesca are the identical triplet babies born to Dawn and Joseph Oliveira last month. 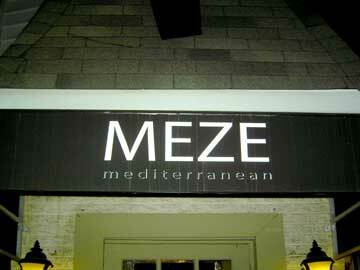 So when you see the parents at MEZE, they should be looking weary and thrilled. All of this in addition to Joseph's opening of MEZE in May. The infant girls weighed two pounds of pulchritude a piece at an earlier-than-expected arrival, and are at Pennsylvania Hospital in good health. The restaurant has been a culinary BYOB blockbuster, ab ovo. Pound for pound, it's maturing as the finest farraginous foray into Cypriot/Greek cuisine Philadelphia has ever mid-wifed. Chef Konstantino Pitsillides' Grilled Hallumi Cheese ($7) is the first appetizer to order so as to ground your taste buds for the remainder of the MEZE experience. The cheese is sharp, salty and golden, crisped to a seared tartness on top, sides and bottom. Once a forkful slides between your lips, a simple grind of molars magnifies this Cyprus cheese's innards to form a molten mouthful. You glow, mollified and glaring at whats left to devour. 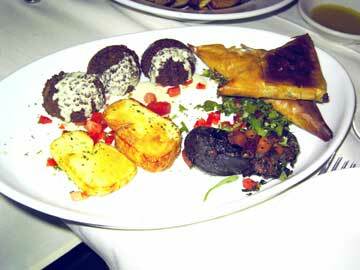 Or try Three Dips Of The Day ($6), a varying trio of huddled Mediterranean puddles set forth on a long thin platter. Dip into a placidly oiled, roasted red pepper mound positioned among sliced purple onion strands and Middle Eastern spices; or drenched-in-garlic scordalia mashed potatoes; or blanched and blackened silk-skinned eggplant ovals bathing in hot pepper flakes and cinnamon; or perhaps a dip of pounded black beans parsleyed perfectly and profusely. Your tongue swirls and sails past Mediterranean flavors and fragrances. Never, ever neglect to order Greek Island Chips "for the table." I don't remember what they cost, nor should you care. A huge white bowl arrives laden with thickly cut potato spears. The spuds look as if they've spent a night or two on a Spartan mountain top, before having been seasoned for a life of Greek drama. 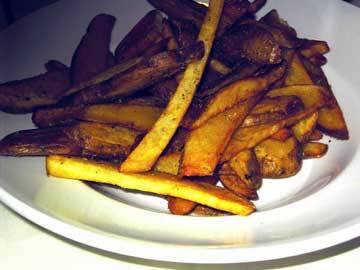 They are redolent of heated oils, cilantro, peppercorns, garlic and hints of lemon and crushed cumin. Your belly begins to feel as if it had once been a hollow wooden Trojan horse. But never beware Greeks bearing potatoes as gifts. These are spectacular. Entrées can be ordered as individual choices or from the MEZE menu. The latter is divided into three sub-choices: Meat, Fish or Vegetarian. If a new visitor, the sampling platters are judicious and prudent selections. 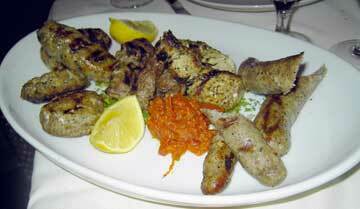 For instance, the "Meat Meze" ($50 for 2) can be the chef's selections of (a) Fried Keftedes, chopped veal and pork rolled and rounded into meatloafs oozing with onion bits and spiked by cinnamon; (b) Cypriot Sausage, lanky skinless tubes of grilled lamb and fatless beef, involved body and soul with Mediterranean herbs so distinctive as to ring Orthodox church bells in your brain; and (c) brilliant green-peppered, lemon-oiled souvlaki; all served with charred pita. The Vegetable Meze ($40 for 2) includes verdantly green filled Falafel, rested Tabouli, some Hallumi cheese toasts, and garlic-gorgonizing humus whose chickpeas have been anointed in lemon oils. I'll not mention the Fish Meze ($50 for 2) except to say that a Sea Bass or Snapper arrives tableside to be filleted by Joseph Oliveira who banters about his beloved birthplace, Portugal, just outside Porto. He's pleased to be in Philadelphia where his newborns are receiving extraordinary care. He's hoping to have the triplets home soon. Pictures abound, and the nature of "identical" becomes beautifully clear. The restaurant has square blocks of slate for flooring, two-toned painted mauve walls and about twenty tables. 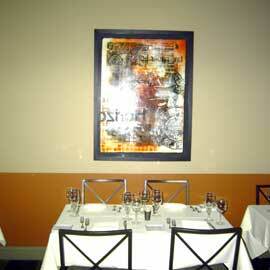 The walls are claimed by framed works of colorful modern abstract works of art. The kitchen is down a flight of steps, which makes waitpersoning a leg-muscle builder. All service is with a knowledgeable and concerned staff, hampered only by carrying the heavy white plates up and down those steps. Desserts may range from a luscious chocolate tart to phyllo-dough-perimetered mixture of nuts and dates. But to savor the subtle Cypriot nuances of lifes sweetness, carouse around a bowl of authentic sopping rice pudding ($6). The hundred turgid pieces of rice are warm and succulent. They become engrained to the inside of your cheeks, and begin to melt as your enzymes co-mingle with the rices starch, dissolving deliciously just as your esophagus opens in greeting. Or claim an elongated plated mélange of Traditional Preserved Fruit ($5). A line-up of slices of fig, bitter orange, pear, dates, cumquat and cold yogurt culminates the meal. Uniquely stylized and elegantly presented, you find yourself at the fruit-filled end of a rainbow of sugary samplings. Ninth Street now, certainly, has a new pot of gold.